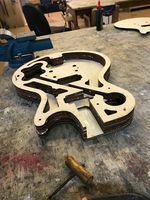 Can a Les Paul guitar be produced through laser cutting? Probably, yes but anyone who knows anything about guitars would ask why... Well, I wanted to give this a go for no real reason other than its something to do that will challenge my skills. I am under no illusions that plywood is not an ideal material for an electric guitar but I'm going to try it anyway! Once I had the model in Fusion 360 I produced a stack of planes that intersected the model and put a blank sketch on each of these planes. I then named all of the sketches to DXF Sketch 1 through to 8 as shown in the image. To pick up the geometry of the model you need to do an intersect in the sketch then finish the sketch, right click, and save to DXF. With the DXF stack ready I then moved over to inkscape. Importing the sketches one at a time (Making sure to check that I was working in mm) and arranging them onto the 800mmx600mm page resulted in the layout shown in gallery. These can then be taken over to Lasercut5.3 via any method you prefer. I took a couple of videos and have uploaded them to youtube. See below. Apologies about the vertical video, what was I thinking! I put some through going 5mm holes into the model for aligning the stack. I used M5 machine bolts and was able to unscrew them once the glue dried. This alignment method has worked quite well but hasn't resulted in a perfectly smooth external surface. Oh well, the imperfections can be sanded away and any that remain will just add character. The very top layers were aligned using 10mm dowels in the holes where the bridge will go. Seemed to work ok! I hadn't originally intended to sand this at all but the edges were just a bit too rough due to the misalignment between layers and it didn't feel nice to hold so my hand was forced. The top was sanded using the mouse/ palm sander in the dusty area. I wanted to maintain the layered look of the laser cut layers so didn't go over the top; just broke the sharp edges. For the edges I used a combination of the disk sander and a drill mounted drum sander, both inside the dusty area. This worked well and has made the guitar nicer to hold whilst maintaining the characteristic layered effect of the ply. I decided to use a roundover bit to break the edge on the back of the guitar. This makes it much nicer to hold. The bit I used is a 1/2” shank roundover bit. I’m unsure of the actual radius as it’s not marked on the tool but I’d hazard a guess at 3/8”. A slight oversight on my part. I could’ve included this in my model and laser cut it in but I forgot, whoops! I used a 25mm Forstner bit to drill the hole and had the body clamped in a wooden bench vice. The finish of the hole isn’t great due to my slightly unsteady hand but it’s nothing that the jack plate won’t cover up. I have modelled the neck with a 5 degree angle from the body and a 15 degree head stock angle. The truss rod slot was modelled in to suit the one I ordered. I'd like to do the majority on the laser with ply and then glue an approx 5mm thick hardwood veneer on top for the fret board. I was keen to have a dark wood for the fret board so ordered a piece of Indian Rosewood from Ebay; Thickness is approximately 7mm. The price including postage was £12.30. 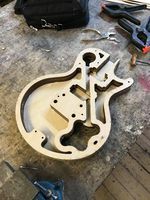 The piece was a little bit larger than I required so I tested a few different cutting parameters in the laser cutter to determine the best values for cutting the fret locations and cutting through the total thickness. I ordered 1.8m of DHP-20 fret wire from eBay. Not sure if this means anything to anyone, it doesn't to me! Total cost including postage was almost £20, quite pricey for the length of wire but seems to be about the going rate. In order to adjust the action of the neck, a truss rod is needed. Without looking into it too much I ordered a 480mm dual action one from ebay at a cost of just under £10. When it arrived I realized that its exactly the width of two sheets of 3mm plywood! This makes me very happy as it massively simplifies the neck construction. Laser cutting the neck parts proved easier than I expected and the project appears to actually look like a guitar now! I was able to contruct planes and extract the sketches from fusion no problems this time round using the same method as for the body. The added benefit of the neck being that this part of the guitar is symmetrical so I only needed to export one side. Result. I also exported a sketch for the fret board; it is slightly more complicated than the rest in that I had to set up two sketches in Fusion 360 for one lasercut 5.3 program; one sketch for the outline and one for the fret locations. I overlayed the two sketches in Inkscape, worked great! Laser cutting the neck itself went without a hitch really. There were some knots in the wood which meant the cut hadn’t quite gone through but Ian gave me a great tip of just finishing it off with a Stanley knife. Total material use was two sheets of 800x600mm and I probably could’ve reduced that further. The fret board was slightly more nerve racking, for one the wood is much more expensive than ply so less room for error and two, I’m not very experienced with the laser at all yet and this would be the first time cutting something not on the helpful list at the Hackspace. The settings I eventually came to are shown in the gallery for this section. In addition to these settings I covered the part in masking tape to reduce scorching, worked very well. No fire so I consider that a massive success. 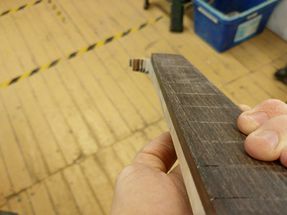 The depth of cut on the exterior profile was on the boarder line of ok; it didn’t cut cleanly through but with some mild persuasion the fret board did eventually come loose. For the fret wire cuts, it seems ok apart from the slight double cuts caused by my cad. Nothing superglue won’t fix I think.. I will come back to this when I actually get round to fitting the wire. Feeling good about getting all the laser cutting done in one evening I thought I'd power through and go straight onto laminating the layers together. It started out really well; I cut some 3mm steel rod into short lengths to use as alignment pins and did a test fit. All seemed absolutely fine and I was happy to start gluing it together. I stacked up the sections so that I could pick the top one off the pile, cover it in glue, slide it onto the alignment pegs and press together. This went really well for 3 or 4 layers but I quickly got out of sync with picking up the right layers and ended up having to remove layers I'd just glued, insert a new layer then return the one I'd just removed. Extremely frustrating! If I was to use this technique again I would add a number or identification mark onto each sketch in inkscape and engrave it during the laser cutting operation. That would've completely solved this problem. The next issue was dropping the pot of wood glue I was using. In itself this isn't a problem, but, it meant that the nozzle broke and I lost the ability to apply the glue with precision. I switched putting a glob of glue onto the layer and spreading it with my finger, this meant that the amount of glue squeezing out when I pressed each layer down was ridiculous and very hard to manage. It became a really unwanted sticky white mess. When I brought the clamps out the 3mm plywood really started to show its weaknesses. Every time I applied pressure on the clamp the layers would bow, twist, pull apart at the top or bottom and generally do things I didn't want them to do. If I was to repeat this I would use a minimum of 6mm thick plywood as it would be a bit stiffer. 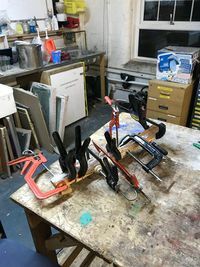 I carried on regardless and used enough clamps to ensure that all the layers were well squeezed. 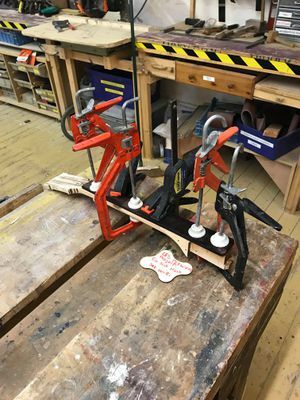 Clamping arrangement will be shown in the gallery below. The result was generally quite good despite some bowing. Unfortunately I couldn't get in with a damp tissue to wipe all the squeezed out glue so it was quite messy prior to sanding. I used a combination of the mouse sander, the handheld belt sander and the disk sander in the dusty area to clean up and slightly smooth out the neck. 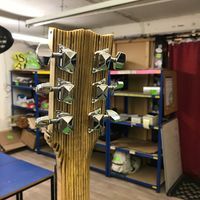 I want to the guitar to be recognisably laser cut so I'm not going to be sanding the back of the neck into a perfectly round profile. You will be able to feel the lamination. It was at this point I realised just how much the clamping has warped the component. Using the handheld belt sander I was able to flatten most of the bow across the neck caused by the clamping forces. 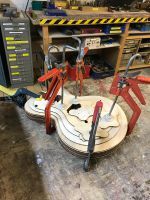 Along the length, there is a definite wave going on; I believe its caused by how soft the layers of birch ply are causing them to deflect significantly when clamped together. 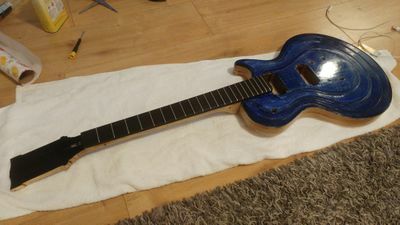 I'm going to carry on regardless as the neck is slightly too wide for the fret board and the wave can be reduced through sanding or routing once the fret board is glued on. 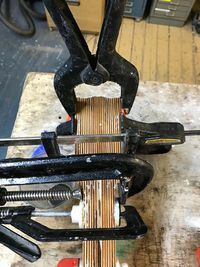 I'd recommend anyone doing this is the future to think about using profile clamps to try and reduce the warping effect. I checked after sanding that the truss rod still fit and was flush to the flat top. It was close, but didn't fit as the layers were slightly compressed. I had to use chisels to both widen and slightly deepen the pocket in a few areas (Mostly towards the heel of the neck). Whilst I had the chisels out I made sure that the tenon on the neck would fit snuggly into the pocket on the guitar body. I had to make a few adjustments to the pocket but it did eventually fit nice and tightly. I thought it important to do this before gluing on the fret board to reduce the risk of damaging the nice rosewood with large chisels. 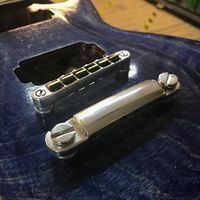 I started this operation by ensuring the truss rod was definitely in the slot; absolutely wouldn't want to have forgotten that. The fret board was covered with glue and then clamped up using a few quick clamps. No problems here as both faces were flat so there was no tendency for the fret board to twist. I left it to dry in the workshop for 24hrs on one of the benches with a Do Not Hack note. 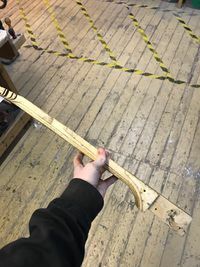 The result was a good bond between the fret board and neck; It is quite a bit meatier than I expected it to be, maybe I should've 3D printed a small section of the model just to check the grip. I'm not unhappy with the thickness, its feels very solid; it's just unexpected. 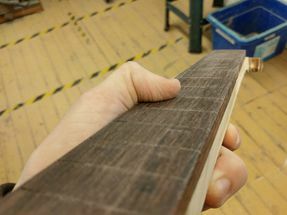 In the pictures you can see how much the neck sticks out from beyond the fret board. I think this has come from the plywood being a slightly different thickness to what I expected. Its worked out well though because I can sand this flush and take out the warping from the gluing operation. I sanded the sides of the neck flush with the fret board using the mouse sander, belt sander and just sand paper. I was a little bit too aggressive on the disc sander and have accidentally put a small notch on the fret board. With the neck glued and mostly sanded, the next step was fitting the frets. I started by checking the laser cut fret positions to see if the wire would fit straight into the slots. 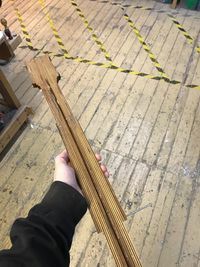 It didn't quite fit due to the kerf of the laser being too thin, so I had to slightly widen each fret using the Japanese pull saw in the woodwork area. I then cut the fret wire into rough neck-width lengths using a pair of snips from metalworking. The wire has a tendency to ping off so its best to hold onto it during each cut and wear safety glasses. With each piece of wire cut I tried hammering the wire into the slots with a soft mallet but wasn't able to get the frets to sit flush consistently. I tried slightly bending the frets but didn't have a steady enough hand and bent more than one completely in half, whoops. 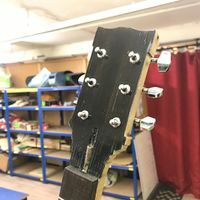 Giving up on that, I found that filling the slot with a small amount of super glue before tapping in the fret worked well. If the fret wasn't quite seated correctly I simply held it, tapped it best as I could & then held it down until the glue dried; didn't take long and resulted in a very solid feeling fret. I trimmed the frets using a junior hacksaw so that they stuck out by about 1mm from the edge of the neck and then filed the edge to remove burrs and make it feel nice. This was a very tedious job so it took two sessions to complete. Due to a slight difference in thickness in the CAD model and resulting thickness of the body there was a mismatch between the heel of the neck and the body. I used the bandsaw to cut the neck down to size and then sanded it flush. Ive also included a shot here of the neck angle. I could just buy this stuff in cheaply but I want to have a go at making it all my self. I'll try to document my thought & manufacturing processes as best as I can. 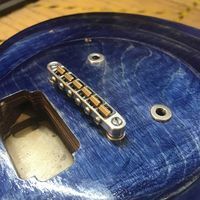 The tune-o-matic bridge is used to anchor the strings on the body of the guitar. There are two parts to it; the stop bar and the bridge itself. The bridge and stop bar assemblies have been modelled below. 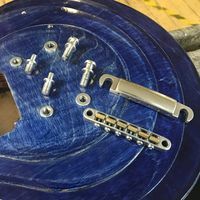 There are no complicated over-hanging features meaning that they could be produced through conventional metal working processes or through casting. I haven't modeled notches for the strings on the bridge as these will be put in by hand. I also haven't modelled the threads in for the pegs yet simply because I haven't researched what diameters I need to leave, will have to check the Zeus reference book in the metalworking area. 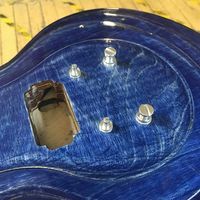 Although I was confident that the part would fit the guitar, I wanted to check that the radius on the top was OK as its quite hard to gauge through the computer screen. I was quite happy with the result! This was printed on my CR-10s at home but could easily have been done on the 3D Printer at the hackspace. In the initial revision, I modelled a string spacing of 8.75mm. Today I've checked the printed part against one of my guitars and it seems a little small so I will be increasing it to 10.4mm. This looks much more like the real part. I decided to have a go at producing these parts via CNC Milling. I could also have tried Sand Casting, Lost PLA Casting or traditional milling. 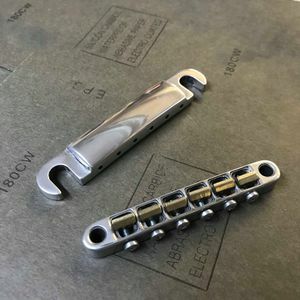 Our CNC Mill hasn't been used to cut aluminium before, as far as I know, so I wasn't sure if this route would be a viable option but wanted to try it anyway. Turns out it can machine aluminium with great results. The toolpaths were programmed from my models using the Fusion 360 CAM Tools. I was unsure where to start with speeds and feeds but knew I would have to take very tiny cuts due to the nature of the high spindle speeds and, relatively speaking, flexible frame of the CNC mill. I watched lots of videos on youTube of Chinese 6040 milling machines, that are inferior to our mill and used that as a baseline. Well aware that this is un-trodden territory for our CNC Mill, I decided to buy a fairly sizeable collection of mills from eBay prior to doing anything just in case I snapped any tools. This proved to be worthwhile as I did end up snapping 2 of the 3.175mm End mills during the first operation; I even caught one snap on video! For the 6mm tool I settled on using 10,000rpm (setting 1 on the Kress spindle) with a depth of cut of 0.5mm and a cutting speed of 900mm/s. This worked well and I think there may be some room for improvement here as the tool didn't seem to struggle at all. One speed that I would be apprehensive to increase is the plunging/ ramping speeds as this seems to be the most strenuous operation. I struggled a bit more with finding working settings for the 3.175mm bits; my first two tries resulted in snapped bits! I seemed to have got it on the third attempt with 0.4mm depth of cut and 600mm/s cutting speed. The 3.175mm milling bit really didn't like machining through chips, I think this had something to do with both of the snaps I saw. To get around this I started carefully squirting a small amount water into the pockets as they were being cut to evacuate chips; worked well. I started by rough cutting the part out of the unused stock from OP1; This was done using the chop saw in the metalworking area. I removed burrs using a file to ensure that I wasn't going to get any false readings when zeroing the CNC axis. The majority of the set up time then came from installing a machine vise on the bed of the CNC Mill, making it approximately square to the axis using a Dial Test Indicator (DTI) and setting the G54 offsets. My method of ensuring the vise was square was less than ideal; I will definitely be changing it in the future. The vise was positioned roughly on the bed and lined up approximately by eye. The DTI was then mounted onto the shaft of a 6mm milling bit and placed into the Kress spindle, with the power switch on the spindle off. I then located the tip onto the workpiece, preloaded it by a couple of mm to take up the play and used that to scan across the X, Y and Z planes. If there was clearly a high side I knocked the appropriate end of the vise to bring it true and re-scanned the surface. This whole setup can be described as loose at best and I wouldn't trust any readouts from the DTI lower than 0.5mm. Still, it did the job. I've uploaded a video that shows this process. The brass saddles were approached with a two stage milling strategy. For the first operation I went in with a 3.175mm tool from the bottom to form most of the shape. The second operation involved rotating the billet 90 degrees around the Y-axis in order to machine the chamfer where the strings sit. The chamfer was machined with a 6mm diameter 45 degree chamfer tool. I then parted off each saddle by manually typing g-code into the MDI interface in LinuxCNC using a 3.175mm tool. In Fusion 360 I defined each tool path once and then used a linear pattern to create 6 copies along the y-axis at intervals of 10mm. This was very easy to do and worked well. In terms of material usage I definitely have bags of room to improve it; the way I did this was very inefficient. I think that the first thing I'd try is rotating the parts 90 degrees around the z-axis and then reduce the intervals so each part is closer together. I found the brass machined well on the CNC Mill. I did snap a couple of my 3.175mm bits, which I think was due to vibrations caused by tool-stickout rather than how fast I was cutting, but other than that, no issues really. Parts still need filing/ de-burring & polishing. In between Op1 & Op2 I cut off the part out of the large aluminium block using the chop saw in the Metalworking Area. I then squared off that face using the Bridgeport Mill. This was done so that I had a reliable flat face for clamping the part onto the bed for OP2. For the anchor and peg pieces, I ordered some aluminium round bar and am produced these on the Myford lathe as the CNC Denford Lathe was out of action at the time of this project due to a dodgy hard drive. As the CNC machine was only used to spot drill the locations for the holes I had to drill through the parts using the Fobco Bench Drill in the Metalworking Area. I used a set of small HSS twist drills that I bought from Wickes fairly cheaply. During the drilling I used some laser cutter scraps to protect the aluminium from the vice jaws; this worked well. For the saddle pieces I first had to fettle them using an engineer's file slightly to ensure they fit into the holes on the Bridge Body. After doing this I mounted them in a vice, two at a time, and drilled though with a 2.4mm drill. I knew this was the correct drill to use for an M3 thread as I'd checked the chart on the wall by the Fobco bench drill. After drilling the holes I used an M3 tap being careful not to damage the thin brass pieces. Worked well. I initially tried machining this out of aluminium as I had lots of this left over from machining the bridge and tail piece. 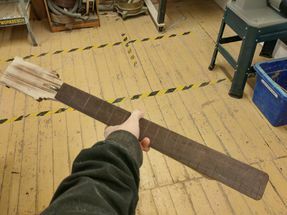 Unfortunately due to a miscalculation, and not measuring the actual thickness of the fret board, I took off too much material. Fortunately I still had some brass left over from the saddles which turned out to be an ideal size. I machined the part on the Bridgeport Mill and was able to get the sizes within 0.1mm of my drawing. This level of precision surprised me as my solution to workholding was less than ideal; to give some context I was using Plywood laser scraps instead of parallels to support the part in the machine vice. Unfortunately I forgot to grab pictures of this. 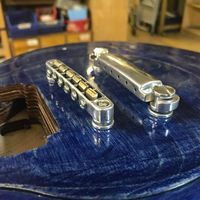 At the moment I have just got a square nut, I will be shaping with a slight radius and adding the notches to match the strings at at some point. These will be cut on the Lathe using aluminium bar. I have ordered a sheet of 30cm x 30cm 3 Ply PVC sheet. As PVC is not laser safe I will be cutting this using the CNC Mill. I'm intending to hand wind these with a DIY Pickup Winder machine. 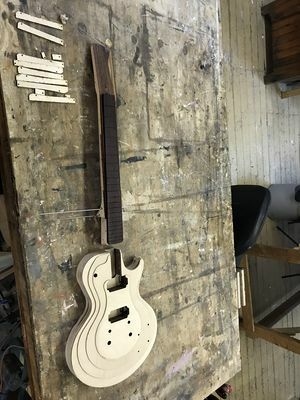 With all the seperate pieces of the project starting to be complete, I will use this section to document the final assembly and finishing of the guitar. This was a very easy job as I'd already done several test fits to ensure that the neck tennon fitted into the slot on the body. I simply filled the slot with glue and pressed the neck in. I then used a pair of quick clamps to apply pressure to the joint whilst the glue set. A satisfying amount of glue squoze out of the joint and was mostly cleaned up using a slightly damp tissue. Before staining the guitar I completed a considerable amount of sanding; I started rough and went right up to using wet & dry paper to get the wood super smooth. I then masked off the neck using masking tape and started applying the Spirit Stain. I bought some Royal Blue stain from Chestnut Products and applied it using a combination of tissue paper and brushes in the fine corners. This worked well and I was happy with the result after a very light sand to even it out. I also stained the head stock with some Black Spirit Stain which was another Chestnut product sourced from Charnwood Woodworking. Once happy with the staining I gave the whole guitar a very light sand all over, wiped it down to remove dust and hung it up in the Spray Booth. Using a rattle can clear lacquer spray that I bought from wilkos, I applied an even coat all over the guitar. In order to get the glossy look I went out and bought some wet/dry sand paper and a drill mounted polishing kit. Being a total novice at this, I initially didn't use polishing compound. I don't know what I was thinking. As you can see from the gallery this meant I very quickly burnt through the thin layer of lacquer. Luckily it was only in a few small areas so I was able to spray another layer of lacquer and get away with it. Second time round I was much more careful with the polishing pad and liberally applied car polish. Much better results! Potentially still needs a little bit of tidying up but I'm happy with how it looks. I peeled off the masking tape and used wire wool to clean the fretboard. This also lightly polished the frets too. To do the oiling I used some Lemon Oil that I bought from Chestnut Products. I applied it using a soft rag, left it for 15 minutes and rubbed off any excess using a clean rag. The fretboard now feels silky and looks great! 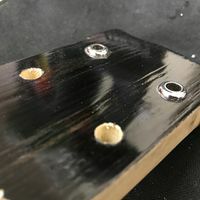 The Tune-o-matic bridge hardware was hammered in using a soft mallet. I had to widen the holes slightly with a drill as I think I didn't quite turn them down to size on the Myford Lathe. I probably would've gotten away with not widening the holes but didn't want to risk splitting the wood. I marked the hole locations using a template that I printed at 1:1 size from my CAD model and then drilled them using a drill press. Jon had to help with this as clamping the guitar wasn't an option and the guitar was a bit unwieldy to hold and drill at the same time by myself. This page was last modified on 16 April 2019, at 13:18.